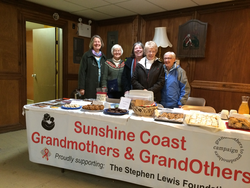 To date in 2018 we have sponsored the Seedy Saturday Concession--see the photo below--the Easter week-end bake sale at Trail Bay Mall, and a booth at Earth Day. The Royal Wedding Tea will be our next event on Saturday, May 19th, at the Driftwood Inn restaurant from 2:00 to 4:00 p.m.
That will be followed by the Fathers' Day Pie Sale on Saturday, June 16 at Sunnycrest Mall. Other events are planned for the summer.